I love the simplicity of this idea. I have seen a few different versions “out there,” but this is my take on counting with cups. 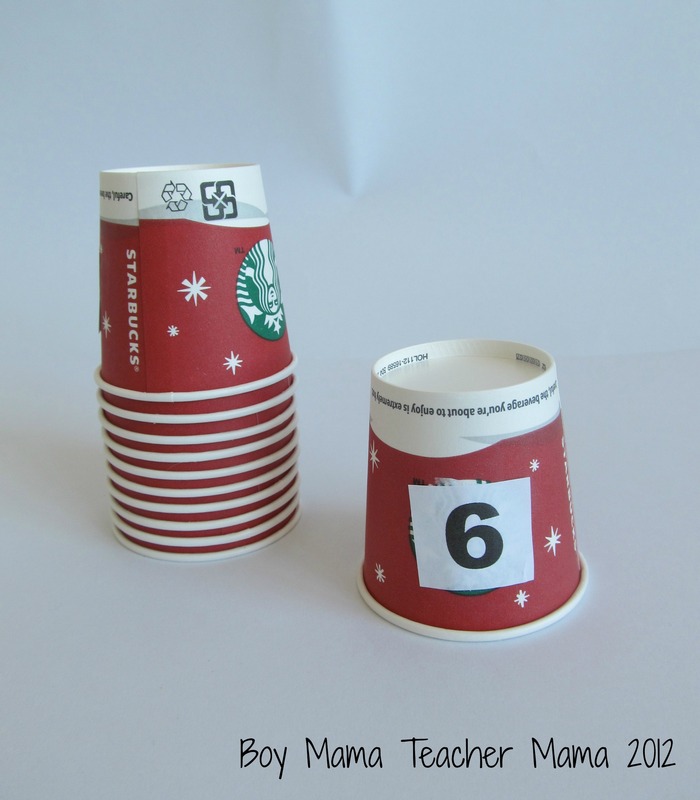 Using a marker, write the numbers 0-10 on the cups. OR have your child create his own cups and use them for the activities below. Optional: Create an additional set of cups numbered from 11-20 to make the activities more challenging. 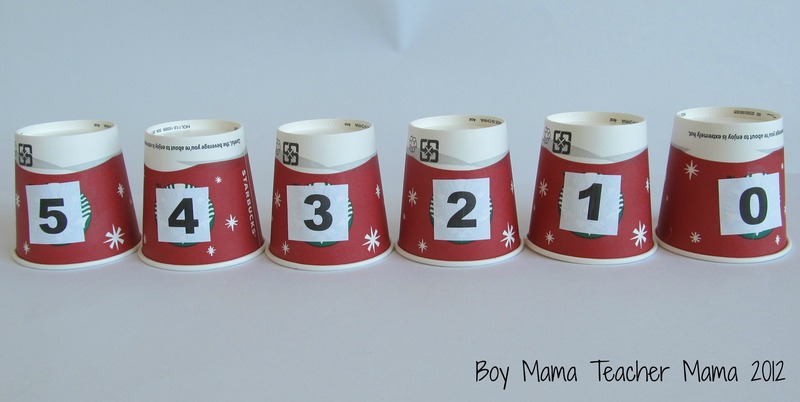 Order Numbers: Give your child the cups out of order and have him put the cups in numerical order. Missing Numbers: Arrange the cups in numerical order and leave out one or two numbers. 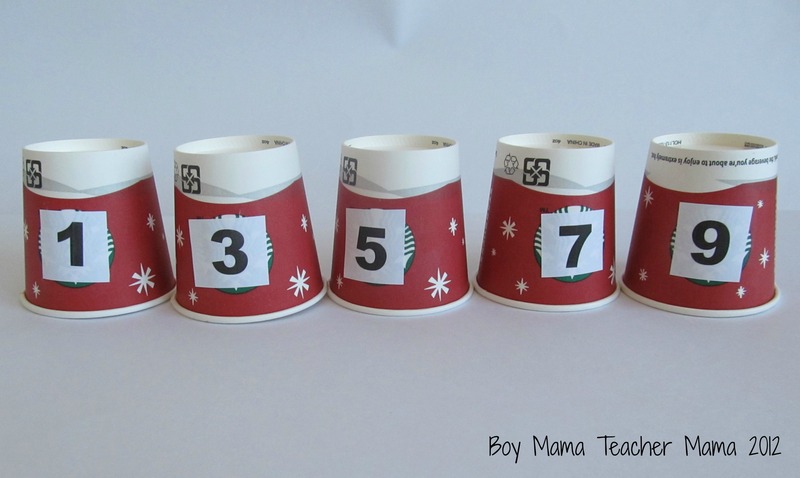 Have your child figure out which number(s) are missing and put the cup in the correct place. Counting Objects: Choose a few cups and place them in front of your child. 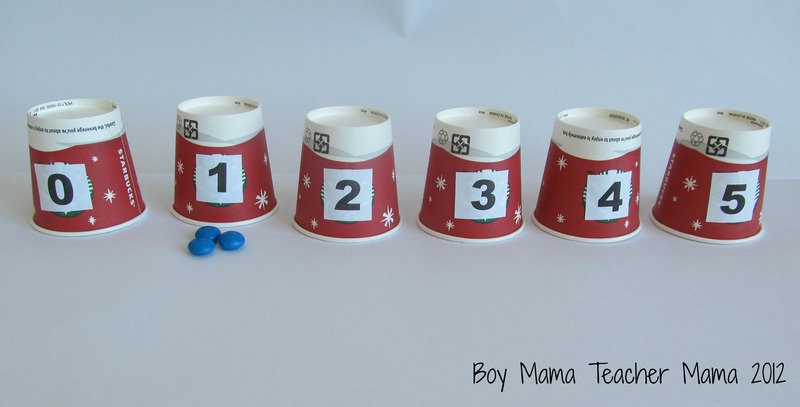 Give him a pile of small counters (ie beans, pom-poms, m&ms) and have him place the correct number of counters on the top of the cup with that numeral. Counting Backwards: Have your child arrange the cups in reverse order (from 10-0). Skip Counting: Pull out all the odd numbered cups and set them aside. 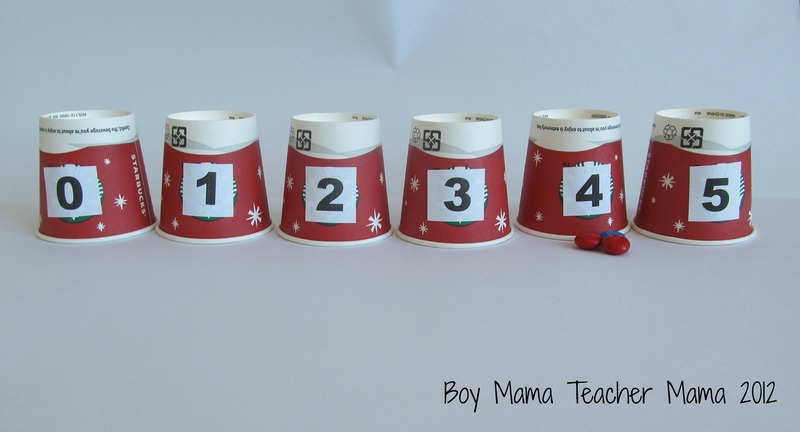 Have your child arrange the cups in order counting by 2s. Try beginning at 0 and counting by 2s and then start at 1 and count by twos. You can practice counts by other numbers as well. For example, skip count by 3s– 0, 3, 6, 9, 12, 15…. the number is between 4 and 8.
if i had 7 apples and ate one apple this would be how many apples are left. 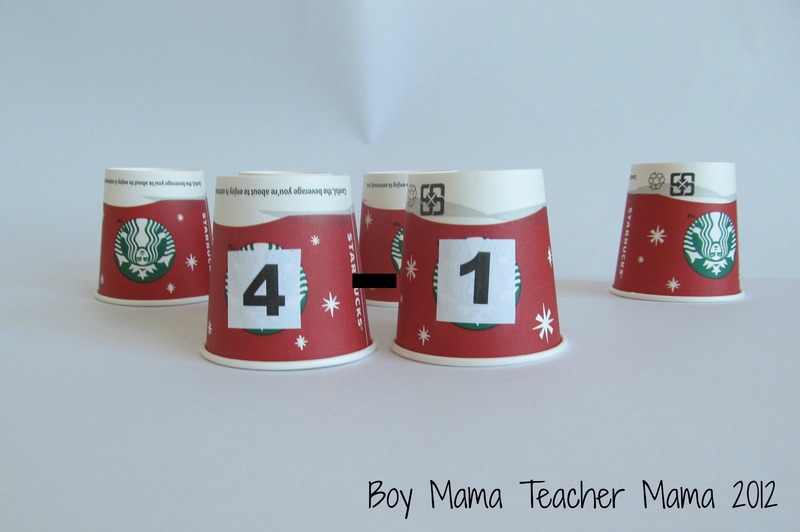 Addition and Subtraction: Turn all the cups so the numbers face away from your child and are not in numerical order. Have your child choose two cups, either add or subtract the two numbers and say the answer. This would work with multiplication as well. Addition Surprise: Arrange the cups facing your child. Place a few counters below each cup. Have your child select a cup and lift it up to reveal the counters. Then have your child add the number on the cup and the number on the counters. This can be done with subtraction and multiplication as well. Example: Your child picked cup 1 which had 3 m&ms under it. Have your child add 1 + 3 =4. Surprise Challenge: Set the game up the same as described for Addition Surprise only this time make sure that there are less counters beneath the cup than on the cup. For example, if the number on the cup is 4, the numbers under the cup should be 4 or less. Have your child read the number on the cup, count the number of counters and then determine how many more counters are needed to make the number on the cup. I love finding new ideas to try with my preschooler. She would be great at this. I’ve got to make them this week. I think the missing numbers would be nice to help with her logical thinking. Oh, these are great ideas! 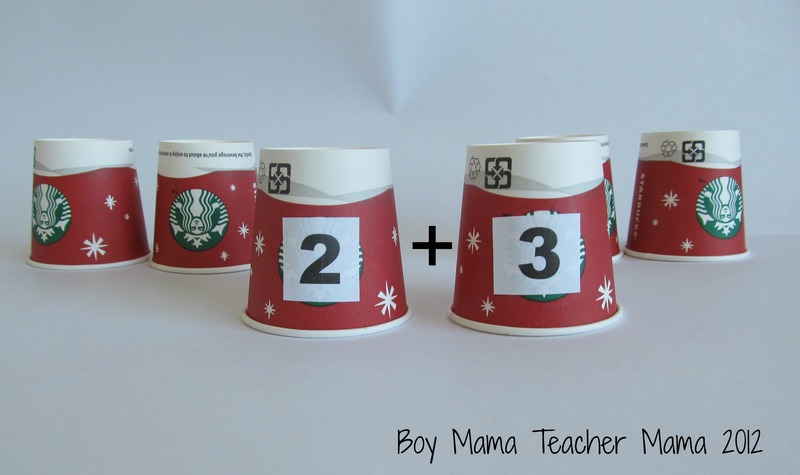 I know my two little ones would have a ball with these counting cup activities. Thanks for sharing at the AfterSchool Party. Love the simplicity and frugality of this math game. Just pinned!